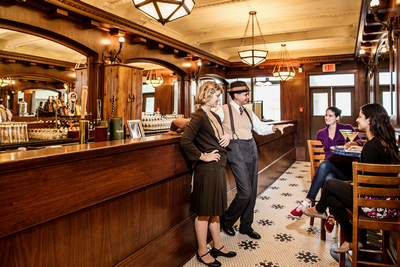 Nested in the scenic river valley on 158 acres of wooded parkland, Fort Edmonton Park takes you on an iconic journey through Edmonton’s incredibly rich history in four distinct eras from the Fur Trade in 1846 to the Roaring Twenties. 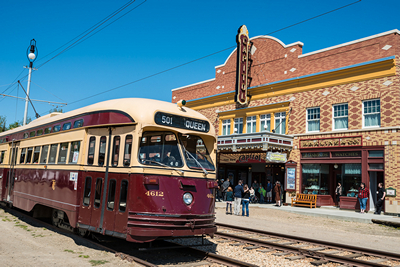 The Park is one of the largest living history museums in Canada offering visitors an authentic, immersive experience which includes numerous historic buildings, artifacts and costumed interpreters. Reconciliation for Indigenous Peoples has been an important issue in Canada in the last decade. An opportunity for reparations in the relationship between the government and people who have been oppressed, disrespected and voiceless, the Truth and Reconciliation Commission has charted a course to renew Indigenous rights and opportunities. This movement has been an important one in the field of tourism and history, with seven recommendations specifically aimed at museums (read more at trc.ca). For many years in Canada, history has been told from the European perspective, starting at the time of colonization, despite the fact that Indigenous peoples had lived on this land for thousands of years before. Museum professionals, with the best of intentions but without personal knowledge of customs, traditions and language, were telling the story, instead of giving these communities their own voice. This paternal approach - the appropriation of sacred objects and stories without permission or proper use - has lead to Indigenous people in North America holding a deep-rooted distrust of museums. Fort Edmonton Park wants to be a leader in changing this. In 2010, Fort Edmonton Park began working with the Indigenous community to discover how they want their story to be told. These conversations evolved into formal partnerships signed in 2015 between the Park and the Confederacy of Treaty Six First Nations and the Métis Nation of Alberta with two unique Memoranda of Understanding. These agreements provided the groundwork for the collaboration and commitment in working with each partner with the objective of ensuring the diversity, richness, and integrity of Métis and First Nations’ history and culture are included in the development of programming and narratives at the Park. These Partnerships have also been the basis for a $165 million Enhancement Project that will break ground in fall 2018 and be complete in the spring of 2021. A key part of the enhancement project is the construction of the Indigenous Peoples Experience. This signature exhibit will feature expanded interpretation of the Indigenous historical experience through immersive visitor experiences and storytelling. The goal is to make culture come alive in a fun, educational and engaging way through multimedia, interpreter interaction and hands-on learning opportunities for visitors. In advance of the opening of the new Indigenous Peoples Experience, Fort Edmonton Park has taken multiple steps to ensure the stories of First Nations and Métis people are culturally appropriate and accurate. By hiring and engaging Indigenous staff and volunteers, and utilizing a comprehensive consultation process with partners through a dedicated Indigenous Relations team, the Park now has a process for validating the content of all programming - including public, education, and outreach. The Indigenous Relations team trains all staff and volunteers interpreting Indigenous narratives as well as continually researching and developing content to expand the stories we tell and the people we engage. Fort Edmonton Park was selected for this award for partnering with First Nations and Métis communities as they work together in the spirit of reconciliation. Last year, Fort Edmonton Park was also honoured to be a finalist in the Governor General’s History Award for Excellence in Museums: History Alive! The goal of the History Alive! award is to “honour significant achievement in the historical field and encourage standards of excellence specifically in the presentation, preservation and interpretation of national, regional or local history.” This national award recognizes individuals or institutions that have made remarkable contributions to a better knowledge of Canadian history. The program that was nominated for the award was the Junior Indigenous Volunteer Program and it is another example of Fort Edmonton Park’s commitment to working with Indigenous partners to help them tell their stories. The program spawned from needs identified by partners including a desire to help Indigenous youth connect with their culture, avoid dangerous lifestyles through meaningful community engagement, and helping youth gets set up for success as they move into adulthood. The program pairs teens ages thirteen to seventeen with an Indigenous staff mentor for an eight-week period. During weekly sessions, the youth learn about museum operations, interpretation and career skills as well as training in specific cultural traditions like beading, preparing hides, use of native plants and the medicine wheel. Staff mentors and their Junior Volunteers also benefit from participating in ceremonies and training sessions with community leaders and elders, including learning the Cree language, and tactics in managing racism. The success of the Junior Indigenous Volunteer Program can be attributed to a number of factors including the true spirit of the Memoranda of Understanding which allowed the partner groups to play a key role in developing and recruiting for the program. Moreover, Indigenous staff and elders contribute by mentoring and leading sessions for the youth. A positive side effect of the program is that it is producing future employees to continue to tell the Indigenous story at Fort Edmonton Park. Plan to take lots of time for relationship building: this is not a fast process, patience and dedication to the relationship is key. Ensure you have clear and aligned objectives between your museum and your partners. Make sure there is a shared goal and define what a positive relationship looks like. Also, be clear how each partner will participate and the roles and processes of all teams. Listen. Be prepared and excited to have your ways challenged and be open to hear what is important to your partners. Finally, communicate. Communicate frequently with the goal of sharing and collaboration.